Heat reflecting, waterproof, simple and reliable, the Fjellduken Original, or Jerven Bag, is a tarp, poncho, bivvy bag and more all in one. This is what Norwegian hunters and soldiers have been using for the past 30 years, as the makers say "The wheel can not get any rounder!" This model, the Original Fjellduk, was released in 1983 and has remained unchanged since then. 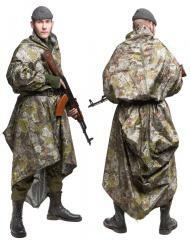 It quickly gained a strong foothold among hunters and outdoorsmen, and soon enough also the Norwegian military adopted it. Fjellduken Original is most basic model in the family, but still much, much more than just a piece of waterproof canvas. The Fjellduk Original itsel, 143 x 286 cm opened, 143 x 143 cm zippered shut as a bag. 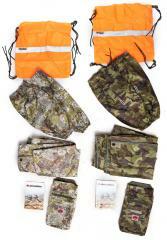 Weight 650 g.
A pair of Armings, waterproof sleeves to cover your arms. 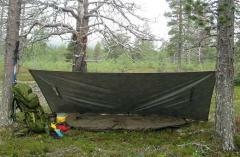 The 143 x 286 cm Fjellduken can be turned into many different sorts of shelters or windshields. There are leather reinforced grommets in each corner and midway along the long sides. The aluminium coating reflects heat, the principle is the same that emergency blankets rely on. This means that heat from a fire, stove or your very body won't go to waste. We won't go into detail regarding every different tarp and shelter setup there is, otherwise you'd run out of coffee before this write-up is over with. Click for a bigger image! 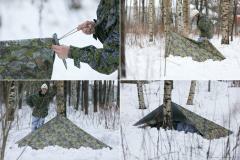 This tarp is anchored to the ground from its corners and the long side has been tied to a tree. By moving the attachment point to the tree higher up you can move the sides of the opening closer together for even better protection. Using the zippers you can turn your Fjellduken into a simple poncho or cloak. There are zippered openings for arms and the sleeves that come with the Fjellduken can be used to keep your exposed arms warm and dry. This is the perfect setup for a hunter or wildlife photographer, sitting in wait under a Fjellduken keeps your trigger finger from freezing and when the time comes you can raise your weapon, be it rifle or camera, in the blink of an eye. As a cloak or poncho the Fjellduken is large enough to cover a medium sized rucksack on the move. 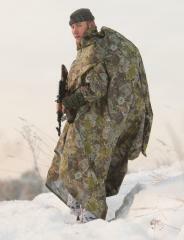 The Fjellduken is a treasured piece of kit in a soldiers pack - it is very popular among snipers, for apparent reasons. "From my own experience I can say that laying motionless on the wet moss inside a camouflaged observation post for hours on end through a freezing autumn night, staring at some bloody road through your NVG can really eat at you. That is one of those moments that I wish I'd had something like the Fjellduken." This model of the Fjellduken is not a standalone sleeping bag, but can be used as one in emergency situations. When folded and zipped up the size is 143 x 143 cm, not enough to stretch out in, but large enough to curl up. Using a sleeping bag inside the Fjellduken gives you effective protection against the elements, if the weather is horrible just curl up inside but remember to leave an opening to give you some "air conditioning". If it's not raining cats and dogs you can stick your head and feet out of the bag and simply use it as a groundsheet and blanket combination, a moist and cold ground won't bother you through the alumium coated JervenTextile. Zipping the Fjellduken up all the way gives you a windsack for sitting in wait for longer periods of time. When you're ready to move on you just zip up the bottom to free your feet, whip out your arms through their openings and get up. Zippers: YKK - a high quality maker you can trust. All zippers are double sided. Nothing lasts forever, but the Fjellduken will serve you for decades if you look after it properly. If you absolutely need to wash yours, do it by hand and air dry only. After washes or prolonged use it is recommended to treat the Fjellduken with a water repellant spray to keep it waterproof. If you stab a hole in yours there are patches available, contact us if the need arises! Condensation: The 100% waterproof JervenTextile doesn't let in water and neither does it let it out, this means condensation. 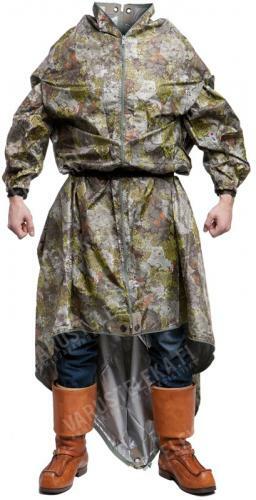 "Oh no," you say, "no Gore-Tex?" Run and hide if you can't live with some moisture, the level of condensation within the bag is nothing to worry about. Condensation can become a nuisance if you're sleeping in the Fjellduken alone, but in an emergency situation like this the condensation is probably the least of your concerns. Most of the time you use your Fjellduken for sleeping in it will be in connection with a sleeping bag or blanket. In this case the moisture will find its way through whatever you are sleeping in and stop at the shell that is the Fjellduken, effectively keeping yourself dry and comfortable. Just shake of the moisture in the morning and on you go! The first thing I did was add Paracord loops to the grommets, to ease the use of pegs and to save the grommets from unnecessary wear. These are easy to adjust for length and quick to detach, no knots need to be opened to do so. Along with the Fjellduken I carry a handful of aluminium pegs and a wooden walking stick with approx. six meters of Paracord wrapped around it as a handle. My favourite one-man-shelter is pitched by securing the four corners of the Fjellduken to the ground with pegs, then raising one of the long edges using the walking stick as a pole. By unwinding the Paracord from the stick it can be tied tight to a tree or peg to keep the shelter up. This is really fast to put up and gives good protection against the wind and rain, the floor area is roughly 250 x 100 cm. I found a clever additional use for the armings in winter time. By wearing them on my feet inside the sleeping bag, coupled with thin merino wool socks, I could eliminate all wake-ups due to frozen toes. With these on I can sleep unbothered through the night!